PRESS RELEASE. Hamburg, Germany – 08 Mar 2016 // IoT Analytics, a leading provider of market insights for the Internet of Things (IoT), and Priori Data, the app store intelligence company, have teamed up and today published the results of the first-ever app-usage based market model for Smart Thermostats. The model is based on downloads of more than 120 thermostat apps and reveals insights never-seen before for the Smart Thermostat market. 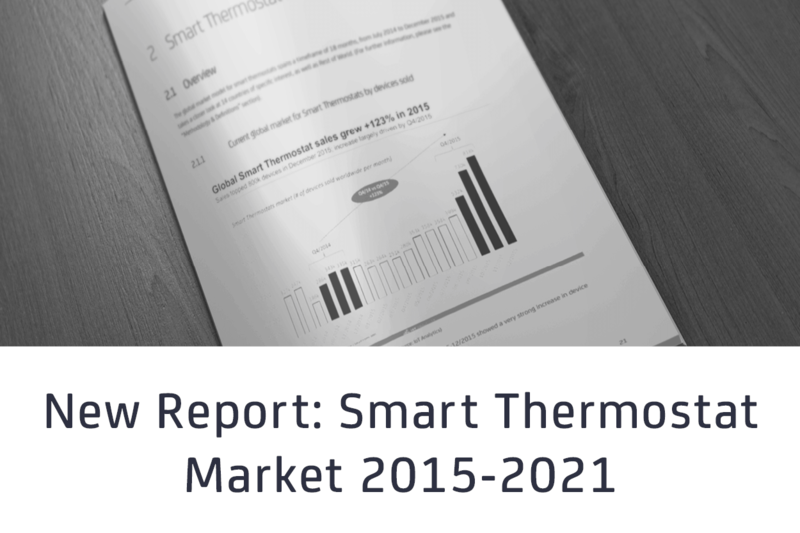 The model is accompanied by a Market Report that is focusing on sizing the opportunity of the Smart Thermostat market for the period 2015 to 2021. The analysis reveals that the $879M (4.9M devices) Smart Thermostat market is currently seeing its strongest ever momentum as Smart Home adoption and assisted-living solutions are quickly becoming more prevalent in the consumer market. The uptake has been especially strong in North America in 2015 and was driven by very strong Q4/2015 sales. 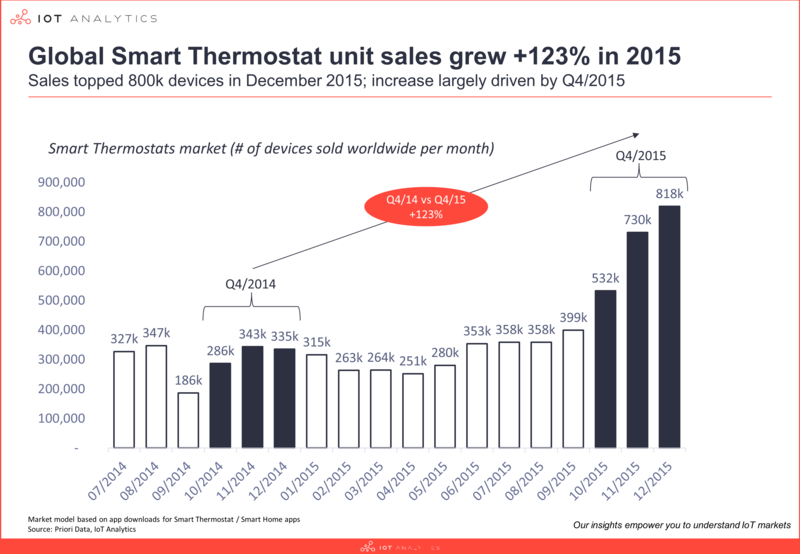 The study examines the Smart Thermostat market of 14 countries in detail (USA, Canada, Mexica, Great Britain, Germany, France, Spain, Italy, China, India, Japan, Russia, Brazil, Korea) on a monthly basis for the past 18 months, both by number of devices sold as well as realized revenue. The study also gives an outlook by key country until 2021 with the total market size reaching $4.7 billion by 2021. To better understand the different market players IoT Analytics profiles 10 of the top Smart Thermostat providers, estimates corresponding market share and sales split by country (see Report Structure below). Demand for Smart Thermostats is currently strongest in North America with 70% global market share. The overall market is currently dominated by US vendors with Honeywell and Nest emerging as the market leaders. European markets are also starting to pick up but interestingly with a more diverse landscape of vendors such as Hive, Netatmo, and eQ-3. 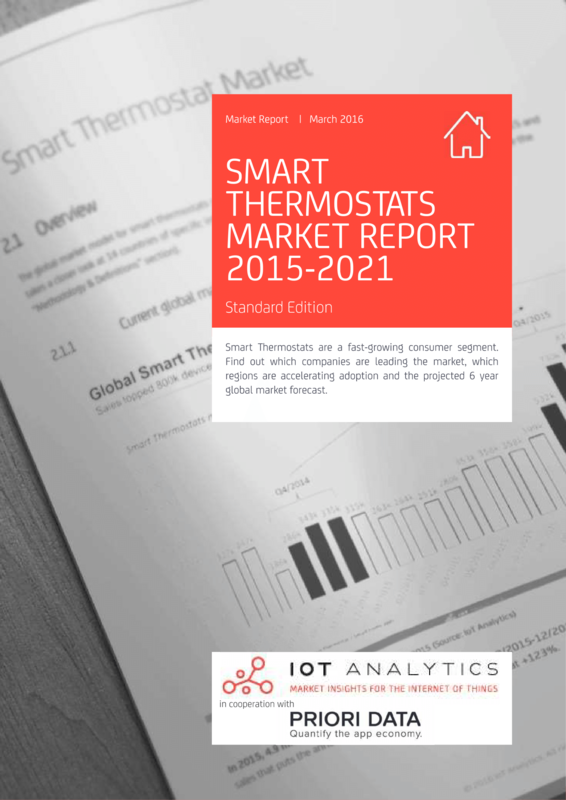 The Smart Thermostat Market Report is available to download HERE. You may also subscribe to the quarterly market model updates. IoT Analytics is the leading provider of market insights for the Internet of Things (IoT), M2M, and Industry 4.0. The specialised research firm helps more than 30,000 Internet of Things decision-makers understand IoT markets every month. 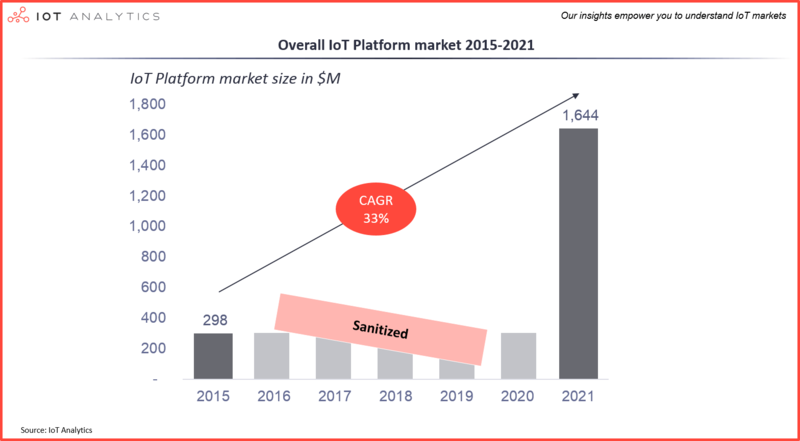 IoT Analytics tracks important data around the IoT ecosystem such as M&A activity, Startup funding, company projects and latest developments. Product offerings include in-depth market reports, technical whitepapers, sponsored research, regular newsletter, as well as Go2Market and consulting services. As a research pioneer, IoT Analytics combines traditional methods of market research such as interviews and surveys with state-of-the art web-mining tools to generate high-calibre insights. IoT Analytics is headquartered in Hamburg, Germany. For more information, visit https://www.iot-analytics.com . ALARM.COM, ASKEY QBEE, BELKIN, CARRIER, CLIMOTE, COMCAST, CONTROL4, DAIKIN, DANFOSS, DEISSON, EATON, ECOBEE, EMERSON, ENERGATE, ENGIE, EQ-3, FILTRETE, FIRST ALERT, GEO, GREEN MOMIT, HEAT GENIUS, HEATMISER, HIVE, HONEYWELL, INSTEON, IRIS, JUNKERS, LENNOX, LEVITON, LOCKSTATE, LUTRON, NEST, NETATMO, OWL, PLUGWISE, PRO1, QIVIVO, ROGERS, SALUS, SAVANT, SCHNEIDER ELECTRIC, SOMFY, TADO, TRANE, VIMAR, VIVINT, WATTIO.